As I mentioned in my Sunday Stash post, I am really excited about a new custom order that I received this past week. I thought I would talk through the design evolution and share the progress I have made piecing this project so far this week. 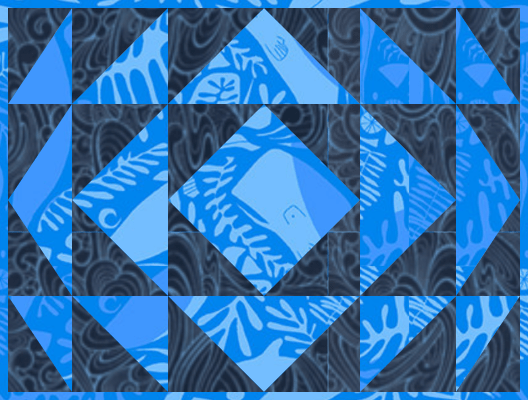 The quilt by Dawn was inspired by blue Briston glass, but it was just the launching point I needed to play with a design for the placemats. My next task was to run some fabric ideas by my client. Selecting fabric for a project with a customer is rarely this easy! The Tula Pink Making Waves in Navy and Lizzy House Giants of the Deep were the clear favorites, especially when I found the blue colorway of the Giants of the Deep. Even better, the fabrics look more wonderful together in person than the swatches online. Once the fabrics were selected, it was time to mock up the design to make sure we were on the same page. The whole process took about an hour of my time to put together; which is quite quick. Before making my final calculations and placing a fabric order, I made a few test blocks to verify my cut list. This week, I am really enjoying piecing the placemat tops together (the order is for a set of 8), and I am always thrilled to see how closely a design looks to the graphic mock up. I have a bit more work to do until I can quilt and bind the placemats, but I have really been enjoying the process and seeing them come together. Linking up with WiP Wednesday and Let’s Bee Social to see what everyone else is working on this week. Really cute placemat, amazing what the eye sees, I saw a completely different pattern until I scrolled down! Oh my, Yvonne, these place mats are beautiful!! 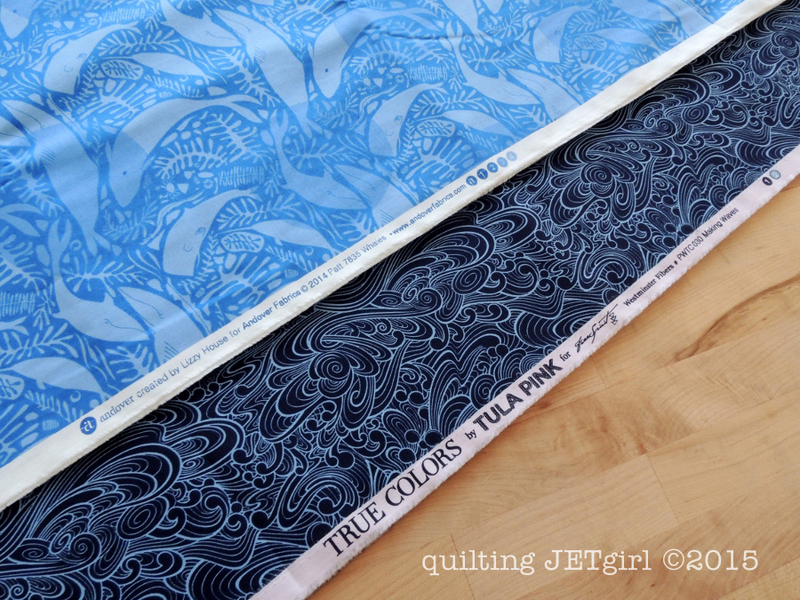 I have some of that Tula Pink waves in both navy and ink…. These place mats have me seeing squirrels!! Beautifully done! 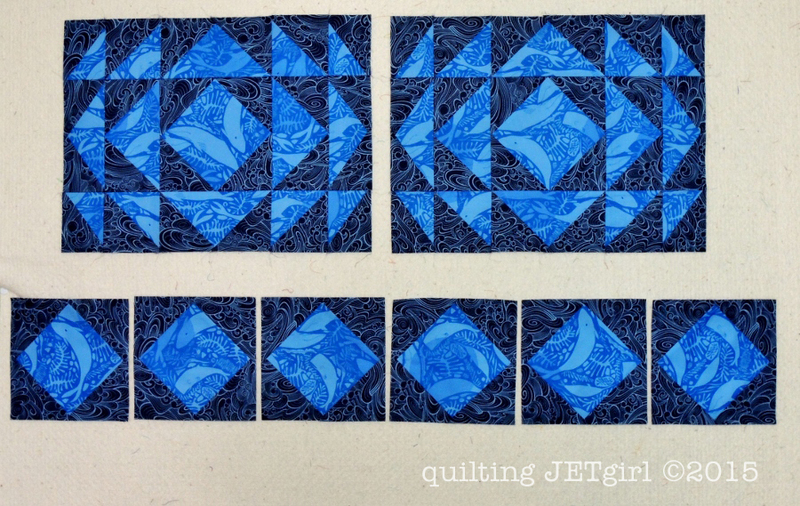 Blue quilt, must make a blue quilt…. I have been saying that for well over a year now!! 🙂 2016. . . it is going to happen! Great fabric choices! I hadn’t see the Tula Pink fabric but it is perfect with the dolphins. Really like your test blocks too with that music fabric! Those two prints work so well together. The placemats look really cool and I love your design! 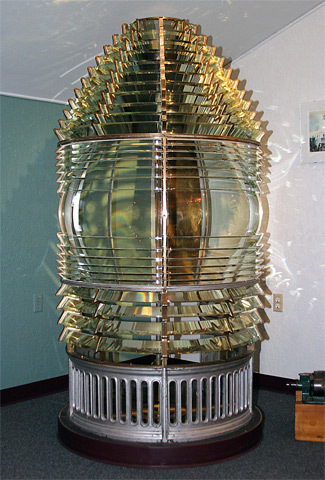 When I was a little girl there was a lighthouse lens in a museum we we would go to from time to time. It was my favorite corner in the museum. I love your interpretation and fabric choices. They’re amazing! That was too easy!!! That lighthouse lens is a-ma-zing!!! What an inspiration piece! Your placemats are wonderful, great interpretation of the lens! I love it when makers share their process. Thanks for sharing yours here! I never thought of a Fresnel lens as quilt inspiration before, but now I’m intrigued. I love the fabric especially the Giants of the Deep. I like your interpretation of the pattern. Have you thought of making the same pattern larger? It would make a beautiful wall hanging! These look like fun to put together! I look forward to seeing how you quilt them! Yvonne, I am delighted that you shared the photo of the lighthouse lens; I do not remember ever having seen one before and it is fascinating and gorgeous. I can see why quilt patterns have been designed to capture the brilliant prism (I hope that is the correct term). You should be extra proud of yourself for designing and choosing the perfect placemat. Seriously, I am totally awed by the effect…..I would absolutely be thrilled to follow YOUR pattern (hint, hint) and make some of my own for a nephew and a set for myself. We both love lighthouses. Thank you for sharing and have a spectacular creative day! These placemats are wonderful. Being from the east coast of Canada I do really love the colour combo. Great design! That is awesome that the entire design/colors/fabric selection process went so quickly and smoothly. I love these SOOOOOO much. Wow!!! Love the colors and the design. Congratulations on the commission and the work. Are you pressing seams open or closed? Will you quilt on the domestic machine or load them all up on the longarm? The fussy cutting is amazing. 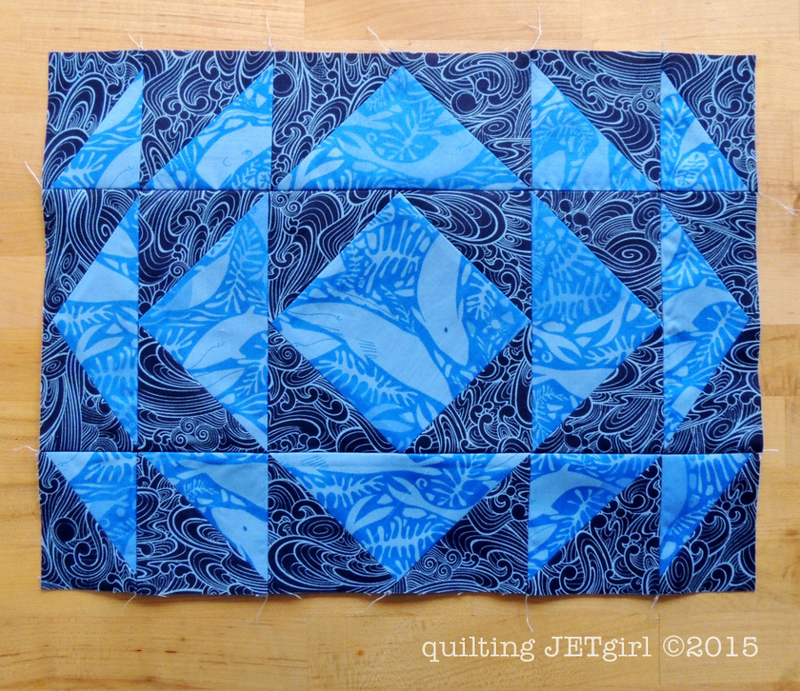 Love how you get the effects of that meticulously pieced quilt just through the fabric cuts and placements of this block. Looking forward to seeing them completed! Very cool placemats, Yvonne! I’m pretty partial to lighthouse lenses.. I have at least one lighthouse keeper up in the family tree and my grandmother grew up not far from the light sweep of the Sambro Island Light, the oldest lighthouse in North America. That design is super awesome! You chose perfect fabrics, too. How will you quilt them? That quilt by Dawn Pavitt is amazing. I love your placements — great fabric choices. Can’t wait to see how quilt them. These are looking great. How awesome you were able to find a finished quilt for more inspiration. What an interesting start off point for the inspiration. And clearly your mock up tools are so useful in situations like these with clients. How fun to see you take this from the first idea, through inspiration and fabric choices and then the final design! They are gorgeous place mats Yvonne! And wow – that lighthouse lens is amazing inspiration! I love how the inspiration has been translated into the placemats. It’s a wonderful design and your clients won’t be disappointed. These are really lovely Yvonne! I know you’ve posted it before but what are you using to mock up your blocks/designs?